Florida Sees An Increase In Car Accidents During The Winter, But Why? As cold weather hits most of the country in the months of November through April, people flock from the great white north to sunny states such as California, Arizona, and, of course, Florida. While many Floridians take pride in the fact that their home state is where many people choose to call home when their own state is being pounded by snow, the influx of temporary residents is also a bit frustrating, if not downright dangerous. According to a 2015 study, Florida reported a 4.9 percent increase in car accidents from November to December, and a whopping total of 63,185 collisions between December and January, the most amount of accidents reported all year. In most other states, those collisions can be attributed to bad weather, but in Florida, where the sun shines almost 360 days a year, bad weather is hardly a factor. So, what is? Temporary residents. Though travelers and tourists are not necessarily the cause of the accidents themselves, they are the cause of more traffic—and more traffic means more opportunities for collisions. Moreover, most travelers are unfamiliar with Florida roads and the rules of the road. They may drive too slow on the highway, or fail to yield to oncoming traffic at particular intersections. Chances are they will use their GPS systems to figure out where they are going. All these factors can work together to make all around poor driving conditions. Avoid cars that are driving too slow. Though you cannot always prevent an accident from happening, you can protect your rights to compensation. If another driver causes an accident that results in property damage, personal injury, or both, you are not without legal options. Even if someone is not familiar with the roads in Florida, and even if they do not understand the laws of the road, they must still drive with reasonable care. If the accident happened because the other driver was trying to operate Google Maps, they technically broke the law, as Florida just revised their laws to state that, “A person may not operate a motor vehicle while manually typing or entering multiple letters, numbers, symbols, or other characters into a wireless communications device” (Florida Statutes 316.305). If the accident occurred because they did not know some other rule of the road, they are still liable, as “not knowing the law” is no excuse. As a Florida resident, it can be frustrating to have to share your roads with so many people who are unfamiliar with them. However, Florida is a desirable state to live, and share you must. That does not mean, though, that you have to forego your legal rights. 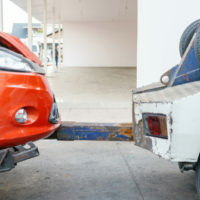 If you were involved in a car accident in Miami that was caused by someone else’s actions or inactions, reach out to the knowledgeable car accident lawyers at Spencer Morgan Law. Our team can help to make sure that you obtain the compensation you need to cover the cost of property damage and, if necessary, personal injury damages. Call 305-423-3800 to schedule a free consultation today.